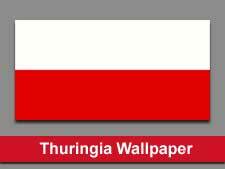 Thuringia is a German state located in the central or east-central part of the country. The state is one of the most beautiful and greenest states of German due to massive forests. Also, the state is known as “the green heart of Germany”. Other features include lush green hills, historical cathedrals, medieval towns, Rennsteig hiking trail, and Oberhof which is a winter resort known for winter sports festivals. 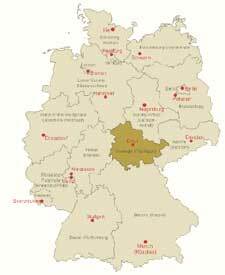 The state is named after the tribe “Thuringia”, whom arrived and occupied the region in 300 AD. The state of Thuringia has a long-term history of various rules. During the 1930’s, the state was one of the places where the people voted in the majority for German “Nazi” party. After the World War 2 ended, the American forces administrated the region for some period of time and afterward, it was transferred to the Soviet Union. The occupation continued until Germany was finally reunified. As we move through the state, we can see various landscapes, forests, hills, beautiful and scenic mountains, and river valleys. In between these valleys, we can see several old villages, towns, and farmhouses. The government of the state also played a major role in preserving the environment by limiting the activities like mining, usage of coal, polluting factories, etc. Agriculture is the primary economic sector of the state. Around 54% of the states is utilized for such activities. Major agricultural products include apples, strawberries, cherries, plums, cabbage, potatoes, cauliflower, tomatoes, onions, cucumbers, maize, rapeseed, wheat, barley sugar, swine, cattle, chickens, turkeys, milk, cheese, and eggs. The industrial sector of the state is also well developed since the 19th century and today many large companies are operating in the state. Majority of the state’s population is non-religious. The EKD Protestants and Roman Catholics are two of the main regions of the state.